I’m about to travel again for the holidays. At this time of year, people on flights are usually coughing, sniffling and sneezing. Messages are everywhere that it’s “cold and flu season.” I don’t think of it that way. I think of it as “build your immunity season.” Years ago, I became aware that if I worried about getting a cold, I’d be afraid every time someone next to me coughed or sneezed. The worry only created stress and as we all know, stress is the real root cause behind illness and dis-ease. So I thought, how can I feel better about this? We can’t escape the fact that germs are everywhere…we have no control over that. What we do have control over is how we nourish and support our immune systems. Think of your immune system as a shield, surrounding your body with love. When you nourish your immune system, your body is stronger naturally. If we think about doing this with love, it can be a joyful experience! With each little action, you are doing something wonderful for yourself! During this time, in addition to saying affirmations, like: “My body is strong and healthy,” I like to have a little scavenger hunt in my kitchen. I seek out the things that nourish and support my immune system and build them into my meals. Things like probiotic-rich cultured vegetables, nutrient-rich broths, green smoothies and mineral-rich sea salt are often on the table during this time. You know where the magic happens though? With herbs and spices. We discussed rosemary’s brain and immune boosting benefits on Facebook earlier this week. 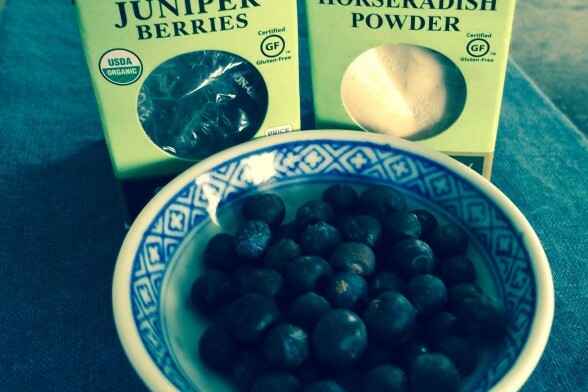 Today, I want to introduce a spice that’s one of the newer ones in my cupboard: juniper berries. Juniper berries have been compared to cypress, with their woody pine-like scent and big detoxification benefits. Yes, it’s the juniper berries that give gin a unique flavor. It can act as a cleanser for the kidneys and has been used for urinary tract infections (you may pee a lot when you do a juniper berry UTI protocol!). Chew a juniper berry just before eating – the bitter taste can help stimulate digestion. 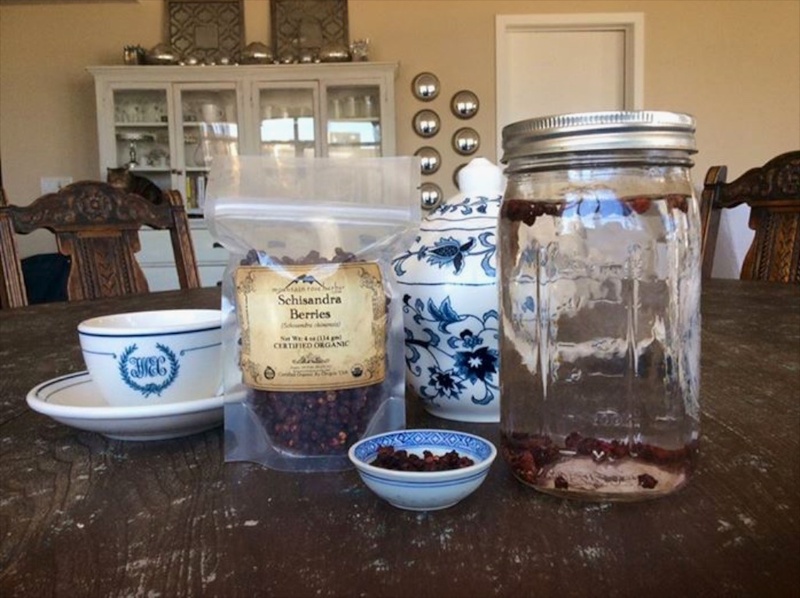 Make juniper berry tea to help clear lung congestion: 1 TBL juniper berries steeped in 1 cup hot water for 20 minutes or overnight. Strain and sip. Add some berries to soups, stews or meat and game dishes. I love adding juniper berry to desserts to add balance to the 6 tastes, reducing cravings and adding satisfaction to the meal. Check out this fun grain-free pancake recipe using juniper berries. Make sure they are not covered in white film — that’s mold. They should be pliable or soft to the touch. If they are hard, they are bad and best not used. Leave them whole until you are ready to use them. They are soft enough to be crushed with your fingers or a mortar and pestle. Or you can use a spice grinder. I’ve just gotten my juniper berries out and plan to use them in tea and some recipes for my upcoming trip. I’m working on a sunflower chocolate fudge recipe that uses juniper berries as one of the spices, so I might take that for a trip treat. 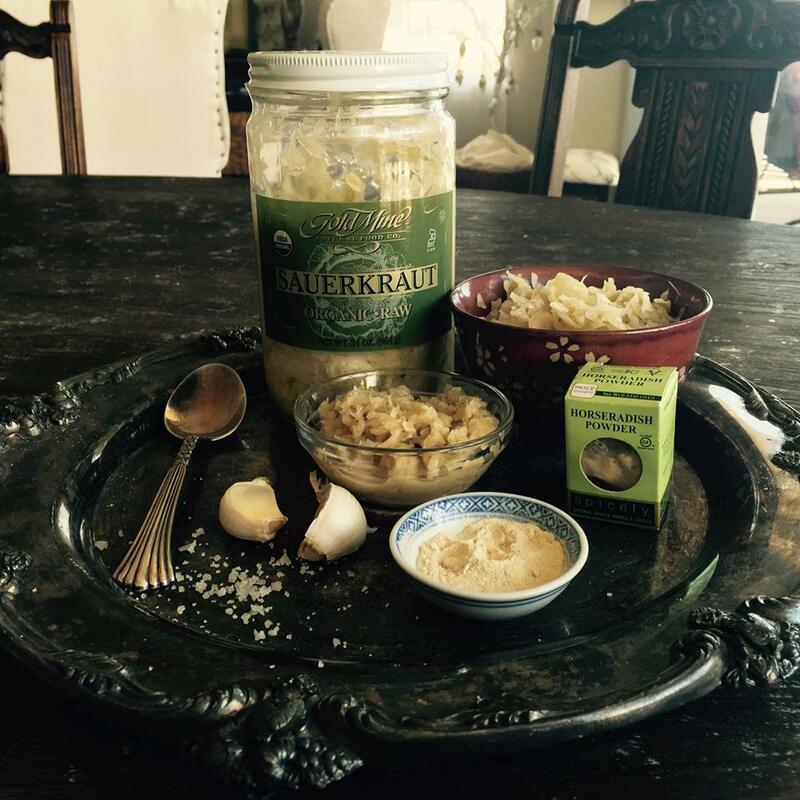 What’s with the Horseradish Powder in the Picture? Horseradish is especially helpful if a cold has turned to bronchitis. I’ll talk more about that soon. In the meantime, you can add 1/4 teaspoon or up to 1 tsp horseradish powder to 1/4 cup mustard (look for an organic mustard made with apple cider vinegar for a really nice mustard) and mix thoroughly. This will give you a nice spicy zip to your mustard. You can do the same with aioli or savory sauces. 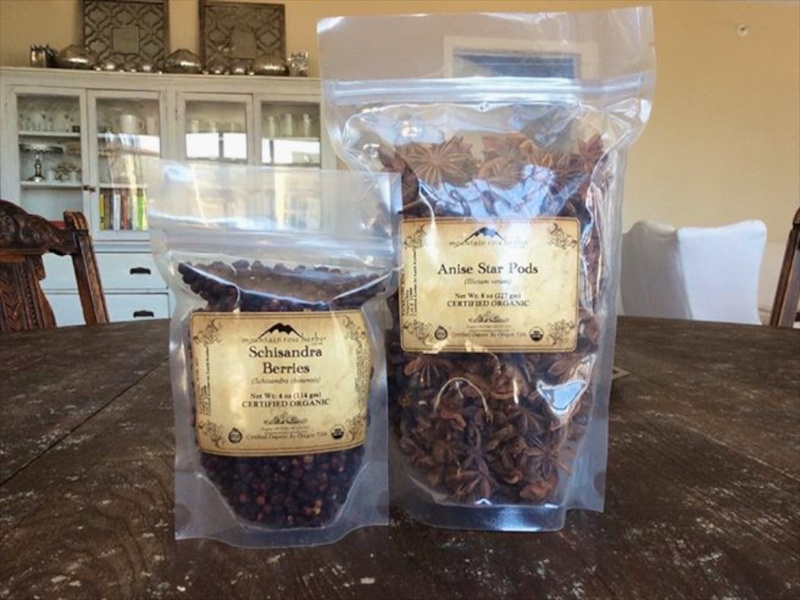 Have you used these spices before? How do you use them? 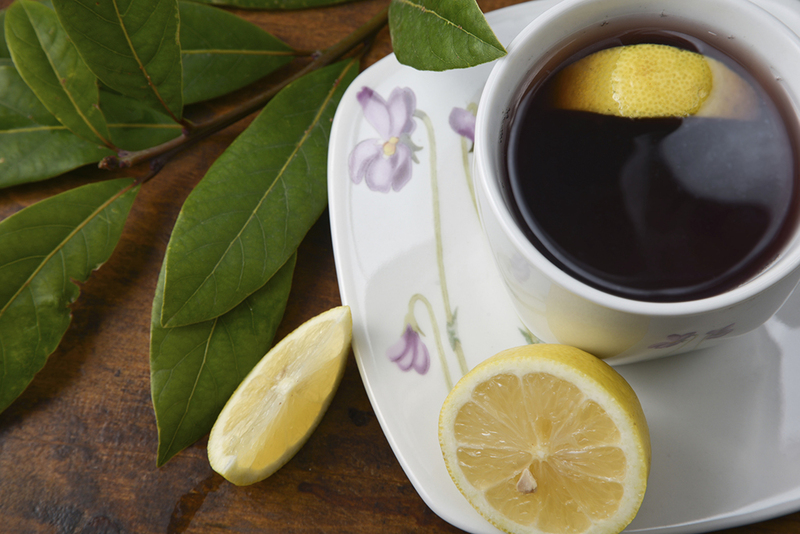 What are YOUR Favorite Immune-boosting Remedies?